Shivanand Tiwari (born 1943)  is a prominent politician from Bhojpur district, Bihar who was a member and an officer of the Janata Dal (United) (JD (U)) political party, which he represented in the Rajya Sabha. First he was a prominent leader and spokesperson of Lalu Prasad Yadav's Rashtriya Janata Dal party. Later he was the General Secretary and spokesman for the JD (U). On 27 February 2014 he was denied renomination to Rajya Sabha, and expelled from the Nitish's Janata faction along with four other Lok Sabha members of the party. After his stint with Nitish's Janata Dal (U), he re-joined Lalu Prasad Yadav's RJD. Bihar is an Indian state considered to be a part of eastern, northern, and north-central India. It is the thirteenth-largest Indian state, with an area of 94,163 km2 (36,357 sq mi). The third-largest state by population, it is contiguous with Uttar Pradesh to its west, Nepal to the north, the northern part of West Bengal to the east, with Jharkhand to the south. The Bihar plain is split by the river Ganges, which flows from west to east. Three main regions converge in the state: Magadh, Mithila, and Bhojpur. Janata Dal (United) is a centre-left Indian political party with political presence mainly in Bihar and Jharkhand. The Janata Dal (United) was formed with the merger of the Sharad Yadav faction of the Janata Dal, the Lokshakti Party and the Samta Party on 30 October 2003. Janata Dal (United)'s party mentor and patron is the veteran socialist leader George Fernandes. JD(U) is currently a part of BJP led National Democratic Alliance (NDA). The Rajya Sabha or Council of States is the upper house of the Parliament of India. Membership of Rajya Sabha is limited by the Constitution to a maximum of 250 members, and current laws have provision for 245 members. Most of the members of the House are indirectly elected by the members of state and territorial legislatures using single transferable votes, while the President can appoint 12 members for their contributions to art, literature, science, and social services. Members sit for staggered terms lasting six years, with a third of the members up for election every two years. 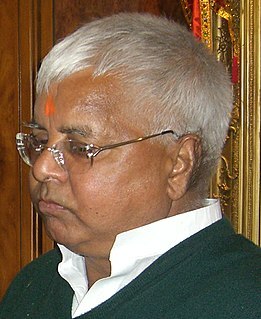 Lalu Prasad is an Indian politician from the state of Bihar. He is the President of the Rashtriya Janata Dal, former Chief Minister of Bihar, former UPA Minister of Railways, and former Member of Parliament of the 15th Lok Sabha. Rabri Devi Yadav is an Indian politician from the state of Bihar. She is a Member of the Legislative Council for Bihar Vidhan Parishad who has served three terms as the Chief Minister of Bihar, as a member of the Rashtriya Janata Dal political party, between 1997 and 2005. She is the wife of the Indian politician Lalu Prasad Yadav, former Chief Minister of Bihar and former Railway Minister of India. She is the current Leader of Opposition in Bihar Legislative Council. Nitish Kumar is an Indian politician. He is the present Chief Minister of Bihar, a state in eastern India, since 2017 and has served in that role on five previous occasions. He has also served as a minister in the Union Government of India. Subhash Prasad Yadav born on 27th March 1967 at Gopalganj (BIHAR) and is a politician of the Rashtriya Janata Dal party and was a Member of the Parliament of India representing Bihar in the Rajya Sabha, the upper house of the Indian Parliament. Mahua is an assembly constituency in Vaishali District, Bihar, India. 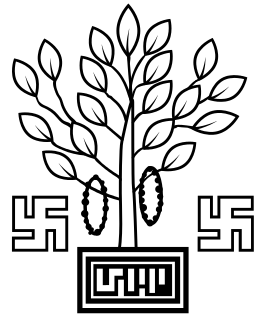 Hasanpur is an assembly constituency in Samastipur district in the Indian state of Bihar. Jan Adhikar Party (Loktantrik)JAP (L); English: People's Rights Party (Democratic) is a political party in Bihar, India. The party was formed by Indian politician Pappu Yadav a.k.a. Rajesh Ranjan in May 2015. Dinesh Prasad Singh is a member of the Bihar Legislative Council. 1 2 "Rajya Sabha MP biography". Rajya Sabha. Retrieved 2012-04-19. ↑ "General Secretaries". Janata Dal (United). Retrieved 2012-04-19. ↑ "News". The Hindu. Retrieved 2014-02-27.